Modern disney characters are getting popularity amongst teenagers day by day. 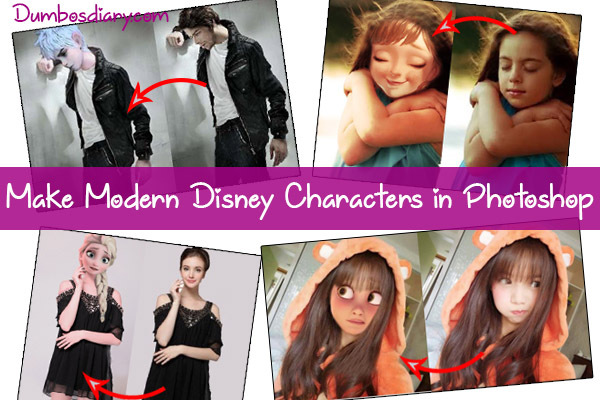 Even children love to make modern disney characters. They love to exchange disney heroes or heroins. These couples are famous with the name Jackunzel, jelsa etc. Today, I’m sharing a tutorial with you about “How to make Modern Disney Characters in Photoshop”. I’ll teach you how easily you can do disney edits. Just by following simple steps you can turn a human being into disney character. Open an image of disney character from your gallery, whose face fits best to the human body. Now open another image whose body we’ll use to put disney face. And select the area of disney prince’s face. Press on the keyboard Ctrl+X on Windows and Cmd+X in MAC. Now come to the image of human being and press Ctrl+V on Windows and Cmd+V in MAC. And here we get the disney face on the image of a model. Now press on the keyboard Ctrl+T in Windows and Cmd+T in MAC. It’s a shortcut of Free Transform Tool. The face of the disney prince is selected now. Reduce the size till gets fit to the size of the Man’s body. Now right click the touch pad, you’ll get Free Transform tool‘s option. Click Flip Horizontal to change the direction of the disney face. The direction of disney prince face has changed. Now select the Pen Tool as shown in the image. And start selecting the face area of the prince. Now right click the touch pad and select Make Selection. Now go to the option Select and click Inverse. And here we have the face of the disney prince. Click the option Mask as shown in the image. Then select the Brush tool. Reduce or increase the size according to the requirement as shown in No. 3. Then reduce opacity to 51% as shown in No. 4. And then select the color Black as shown in No. 5. Now brush the area around the head following the instruction. Create 2 new layers and change the mode to color dodge or overlay in order to adjust the color of the disney prince according to the body. Now click right on the touch pad by keeping the cursor on the base layer. And select merge visible. And here we got the face color of disney prince exact to the body. Here’s the end product. We have made Modern disney character Jack using Photoshop. Make your own modern disney characters and share your images with us.